Commuters caught up in chaos at London Bridge and overcrowding on the concourse should be compensated, according to the Rail Minister Claire Perry. She was quizzed about the continuing problems as the station is modernised during Transport Questions in the House of Commons this morning (Thursday 5 March). Louise Ellman, chairman of the Commons Transport Select Committee, asked about the chaotic scenes in the Tuesday evening rush hour. The RMT union described the crush has life-threatening, with commuters jumping the barriers and squeezing under them to escape. Mrs Ellman said: “The chaotic and dangerous scenes at London Bridge station come after the major disruption at Christmas. Mrs Perry said: “Although I am a strong champion of the unprecedented investment programme going on right across the country, including the rebuilding of one of the most complicated and busiest stations in Europe, that cannot be done at the expense of passengers. “I have had several conversations with the chief executive of Network Rail – most recently before questions this morning – and we are in constant contact with the station management team. “It will take a joined-up approach from operators, Network Rail and the British Transport Police. “And the system is feeding that service to ensure that passenger safety and comfort is not compromised. Mid Sussex MP Sir Nicholas Soames asked a follow-up question. 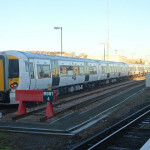 He said: “We all want to see improvements to these stations but the deplorable failure of Network Rail in what is, of course, a very complicated scheme in any event and the failure of the train operating companies to deliver new timetables within such constraints has led to inexcusable delays and inconvenience for my constituents. Mrs Perry said: “I thank my right honourable friend, who has been an assiduous commentator and critic of the current system. “Like me, he is absolutely determined that this unprecedented investment is felt by passengers. “That is why the government are spending £38 billion on passenger improvements.